BERLIN - The weather may have cancelled some local sports but for the Berlin boys lacrosse team, it was just another day out on the turn. 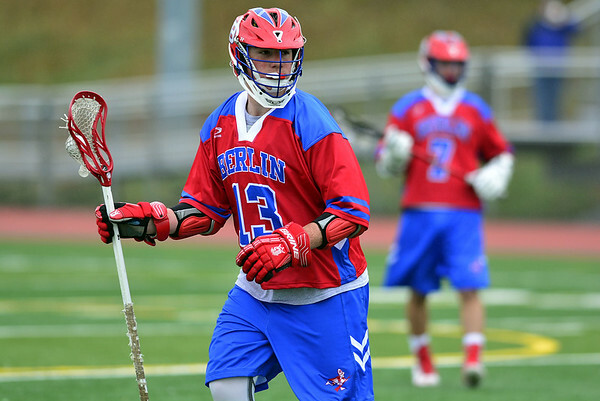 Peter Albert scored a game-high four goals, while Mitch Fliss scored three as the Redcoats handled Tolland in a 16-3 victory on Friday night. In total, Berlin had six players score multiple goals in the contest. Along with Albert and Fliss, Joe Pettinelli, Luke Wininger, Mark Bednarczyk and Nick Grant all had two goals for the Redcoats. Evan Graves and Sebby Fusco split time in goal for Berlin. Graves had a game-high eight saves and Fusco added six. The win moves Berlin to 1-1 on the season and the Redcoats will host East Catholic Thursday at 6 p.m.
Posted in New Britain Herald, Berlin on Friday, 6 April 2018 20:46. Updated: Friday, 6 April 2018 20:49.